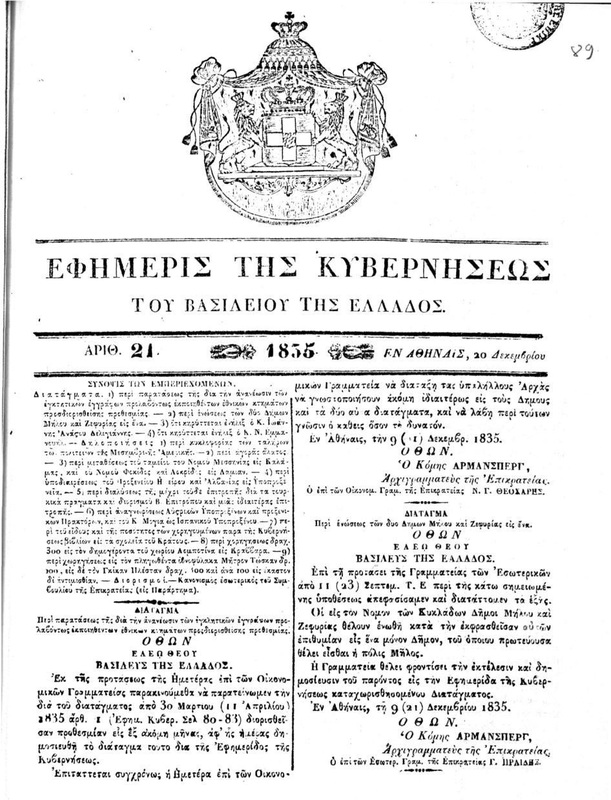 On the official journal of the Kingdom of Greece in December 1835 has been published the decree that deals with the area encompasses the Greek Consulate located in Ioannina, Vlora and Durres. 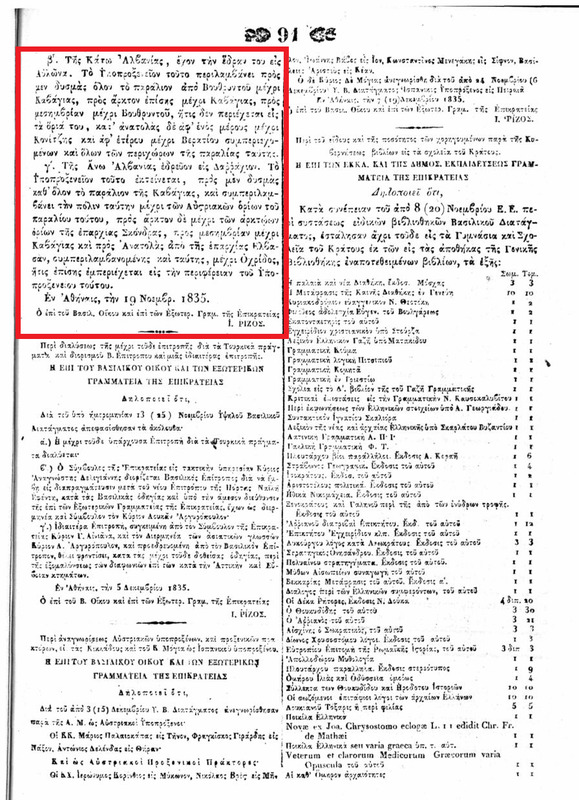 The official jurnal is extracted from the archives of the Academy of Athens. Official journal of the Kingdom of Greece, number 21, published on December 20, 1835. 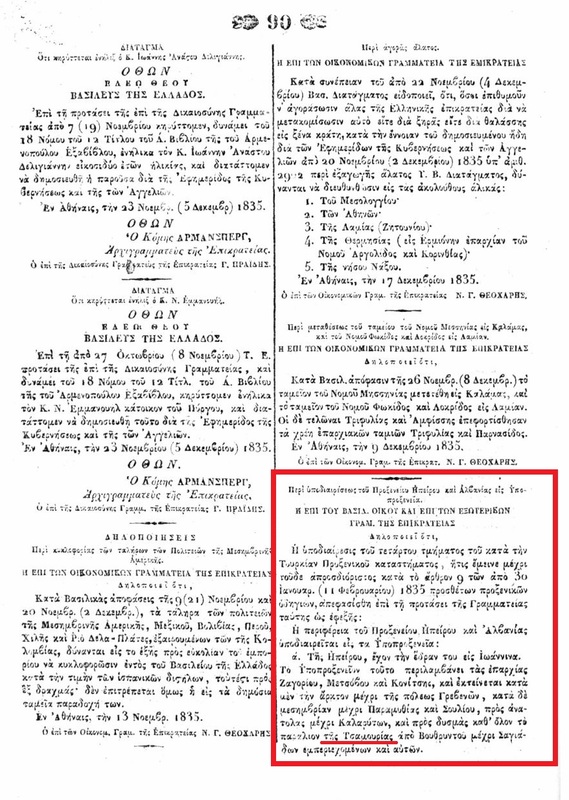 About the subdivision of the Consulate of Epirus and Albania. Epirus which is based in Ioannina. 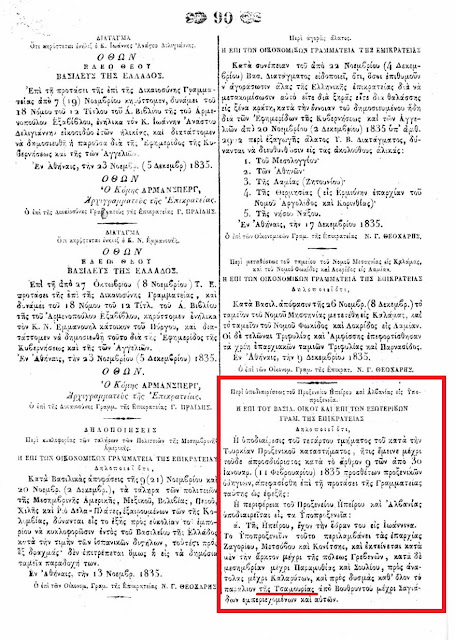 This includes the provinces of Zagoria, Metsovon, Konica and extends eastward to cities of Grevena, Paramithi and Sul, to Kalarite (Golden St., A.Ll.) west along the entire Cham coastline starting from Butrint and contains Sayada. Lower Albania which headquarters in Vlora. This includes all the west coast till Kavaja starting from Butrint up in its borders in the east in a part of Konica and turn in Berat were includes all the surrounding beaches. Northern Albania based in Durres. It stretches all the Kavaja coastline and city limits till the Austrian coast (Kotor), in the borders of the province of Shkodra from Kavaja in the west to the east including Ohrid and the surrounding area. Athens on November 19, 1835. In the Royal Secretary of Foreign Affairs, Jakov Rizos.